Playing from an elevated tee some 70 feet above the fairway, the first hole should play much shorter than its yardage, while offering one of the many spectacular views of the surrounding countryside. The fairway bunker to the right provides direction and outlines the landing zone. 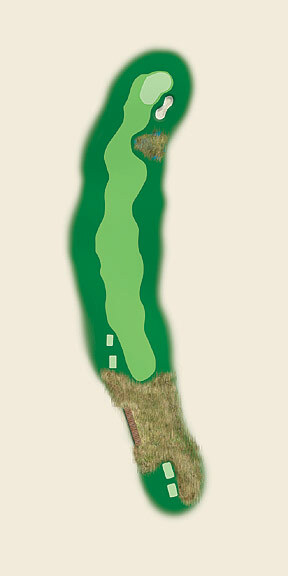 Once off the tee, the approach is to a green surrounded by depressions. It is designed to look difficult, yet play easy. A mid to high iron second shot across the pond in the right center is much easier than it looks. If intimidated, play it safe to the bailout area just short and left of the green for an easy, welcoming chip. The first par 5, one of the signature holes, may be the most interesting to play. 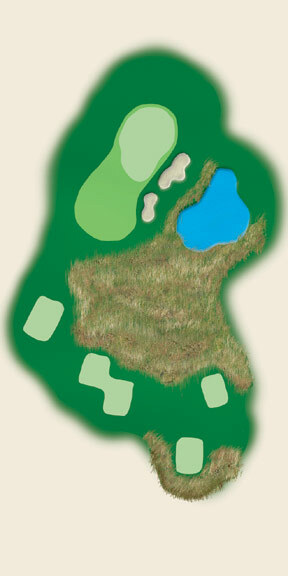 The first landing area is defined by two sand bunkers short right and one bunker long left. By carrying over the right bunkers, the golfer faces less than 240 yards to the green (reachable for the longer hitter). Provided the drive is safe, the choice on the second shot is whether to carry over the wetland on the right side, leaving a better angle into the green, or play left of the wetland, leaving a more difficult approach to an elevated green. The shortest of the par 3s, this hole should pose few problems. From the tees, this hole provides an outstanding view of Millpond Swamp and the surrounding countryside. 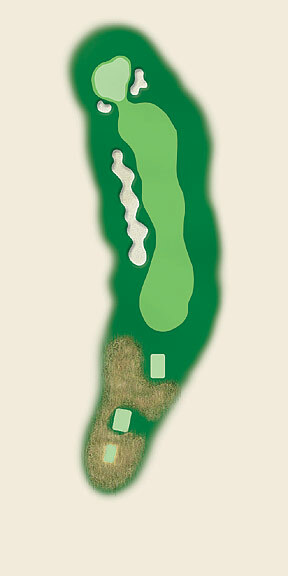 The bunker (and pond below it) to the right of the green should only come into play from the black and blue tees. With the black tee 150 yards behind the gold and red tees, this hole is not as difficult as it seems, provided you play from the proper tee. From the back, this is the longest par 4 on the course. Teeing off from the blue or black tees, your landing area is on top of the hill. If you�re playing from the gold or red tees, your tee shot could roll toward the bottom of the hill, short of the wetlands. 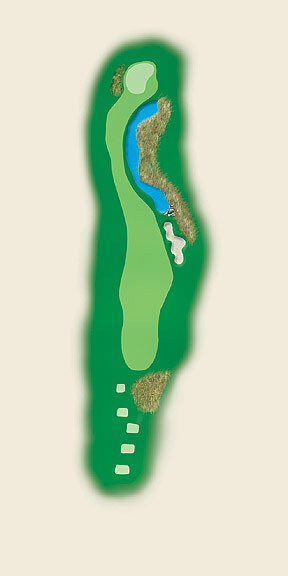 Either way, the approach is to a long green sculpted to accept a long iron shot. 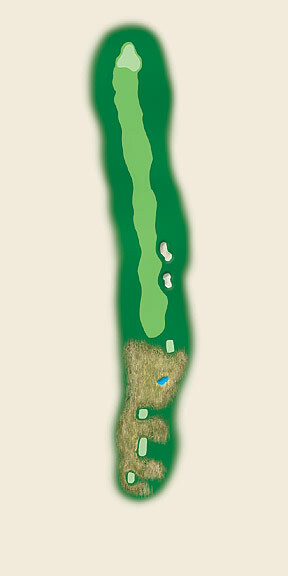 The shortest par 4 provides some options off the tee. Cut as close to the cape bunker on the left as you like to get the better angle into this small green. A safe tee shot, played out to the right, leaves a longer approach over a well-bunkered green. With the fairway cut out of the hillside, even a slightly errant tee shot should funnel back into the landing area. The fairway bunkers are more for direction, but will catch a wayward drive. The second shot is downhill to a landing area short of a deep depression in front of the green. 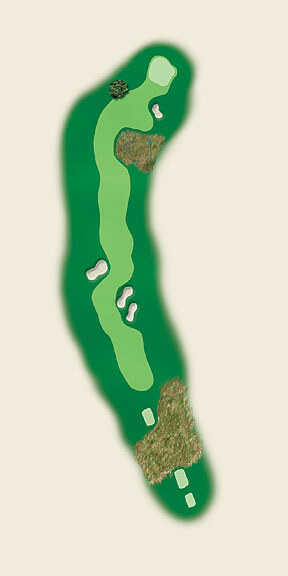 The short pitch is to a challenging green that falls off in all directions. Watch out for the pond at the back right side of the green. This par 3 offers more outstanding views of the surrounding countryside from the tee. However, don�t get caught up in the view, as this tee shot is a difficult one. Playing downhill about 50 feet, this hole will play shorter than the yardage. The green is surrounded by sand, which only adds to the hole�s beauty. This par 4 tempts the golfer off the tee. Playing uphill, the carry over the bunkers is much farther than it seems. The best play is left of the sand. This leaves around 130 to 150 yards to a challenging narrow green that falls off sharply on the right. One of the longer par 4s on the course, this hole finishes the front nine in style. The tee shot is to the top of a narrow ridge. Be bold and try to carry the right bunker, and you could gain 60 yards in roll. From the top of the ridge, the 200 yard approach shot is 50+ feet downhill. 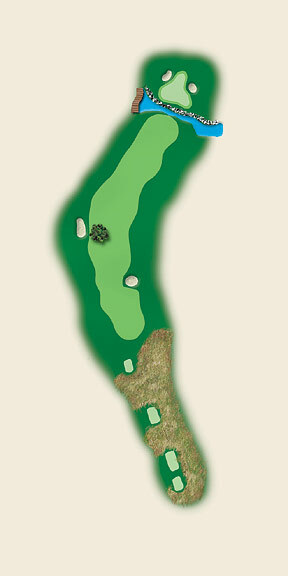 The rock walled green sits across the creek to the side of a prominent ridge (below the clubhouse) and is backed by two bunkers.